Singer/musician and civil rights activist Harry Belafonte's plenary speech (39:38) at the Left Forum 2014. 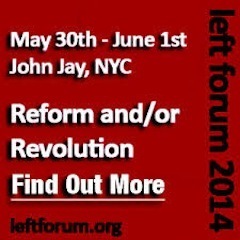 Civil rights activist, professor emerita Angela Davis's plenary speech (34:13) at the Left Forum 2014. Angela Davis's plenary speech (34:13) : Angela Davis is known internationally for her ongoing work to combat all forms of oppression. She is a distinguished professor emerita in the History of Consciousness and Feminist Studies Departments at the University of California, Santa Cruz. Over the years she has been active as a student, teacher, writer, scholar, and activist/organizer. Today she is an advocate of prison abolition and has developed a powerful critique of racism in the criminal justice system. She is a founding member of Critical Resistance, a national organization dedicated to the dismantling of the prison industrial complex. Produced by Scott Harris, Between The Lines radio newsmagazine heard on over 50 community radio stations. Cornel West, Immortal Technique, Marina Sitrin, and Stanley Aronowitz; Amy Goodman, moderator. "Why revolution now? Special Forum Panel Discussion on Thomas Paine (1:22:27): The Anatomy of Revolution: Part I: Thomas Paine. Professors Chris Hedges, Cornel West and Richard Wolff initiated a ten-part series at the 2014 Left Form that focused on the great modern revolutionary theorists. Professors Chris Hedges, Cornel West and Richard Wolff initiated a ten-part series at the 2014 Left Form that focused on the great modern revolutionary theorists. They began with perhaps America's only real revolutionist, Thomas Paine, who in his three great works Common Sense, The Rights of Man and The Age of Reason laid down the foundations by which rebellion is morally and legally permissible. They looked at whether the conditions set by Paine have been met with the rise of the corporate state and ask whether Paine's call for the overthrow of British tyranny should become our own.